I accept a certain amount of risk whenever I get into a taxi. When I get into one in Shanghai, I pretty much assume that I have a 50/50 chance of never reaching my destination. Best case is I get there an hour late and penniless because he circled for an extra 50 miles to jack up the price. Worst case is that I meet my maker screaming like a girl in the back of a filthy coupe. Don’t worry, I always say my goodbyes when I leave home planning for just such an event, so I am, in a way, prepared for such things. What I wasn’t prepared for in Shanghai was the extreme, unprecedented, outlandish over-use of the car horn. Turn signal? Why? You have a perfectly good horn. Check your blind spot? Why? You have a perfectly good horn. People in the crosswalk… Stop? Why? You have a perfectly good horn. About to plow over a mo-ped and kill a man.. Swerve? Why? You have a perfectly good horn. Taxi or shuttle bus, they are the same, they are on that horn continually while driving, and they are frickin’ loud. ..but so are the rest of the drivers. My eardrums buzz after the 45 min. commute to work from all the honking. My room is on the 6th floor and all I hear all night is honking, honking, honking. Oh the noise, the noise, the noise, noise, noise, noise. If there is one thing I hate, it’s the noise, noise, noise, NOISE! At this point, I want to crash. I want to plow over a guy on a scooter. I want to mow down an entire army of women and children in the crosswalk just to avoid hearing that high pitched blow one more time. I’ve concentrated and tried to observe when and why they attack that bugle so much, but I can’t figure it out. The guy on the shuttle did it when there wasn’t even anyone around. I think it may even be a law of sorts, but wow it is clogging up the airways. 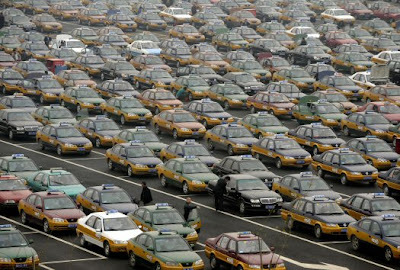 Cabbies in Shanghai don’t use lanes and there is no courtesy. Have your destination written in Chinese, because like in New York, you won’t find anyone that speaks English. They cut in and out and slam and gun. They will shoot through a group of school kids and scrape the cars next to you. Know it and expect it, but above all, bring some headphones and crank it, because holy hell that horn will drive you mad.